Let me start off first by saying that If I Stay was not a book that felt like it needed a sequel. It could have stood on its own and no one would have balked. Having said that, however, this is the book I have pining to read the most in 2011. Every time there's an ARC giveaway, I jump on it. Every time someone reviews it on their blog, I am nuts with jealousy. 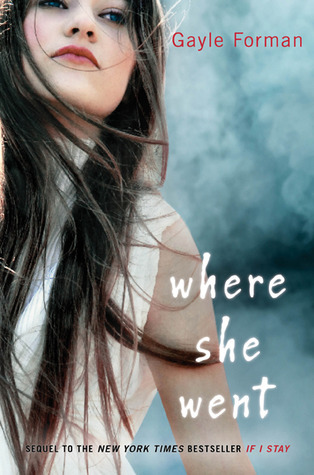 So if I don't think If I Stay even needed a sequel, why then am I so desperate to read it? Because If I Stay introduced me to a world and a set of characters that I wish I could know in real life. I loved Mia and her family. I loved Adam and Mia's relationship. I loved that the characters in the story were intensely musical but not intensely competitive. Music was a part of their family and their soul. It wasn't just something to excel at. I am under no false pretenses that this story will be as magical as the first book. Sequels are often disappointing that way. But when you invest so much of your emotional memory to a book and a set of characters, you have a tendency to want to go back to see how life has been treating them since last we met. I see Mia and Adam as real people. I care about them. I want to know how they're doing. Me too! I don't read much YA anymore, but I adored If I Stay and cannot wait for this one. I really want to read this one too. Good pick! I haven't read If I Stay yet but heard great things about it. I'm surprised it had a sequel though. ...I love your about me. We love the same things and are both Beth. LOL.